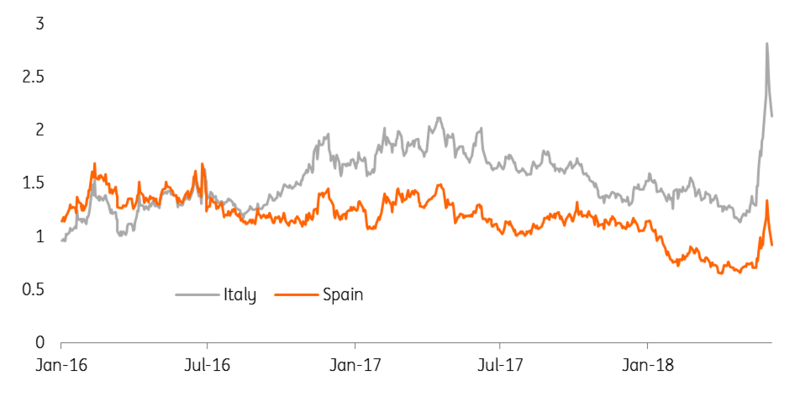 Both Italian and Spanish politics offered some drama over the last few weeks, while on the international scene trade tensions are growing. Eurozone growth is still OK, but not more than that. That means that the European Central Bank’s exit from its easy monetary policy will be extremely slow. After months of paralysis, May saw a lot of drama unfolding in the Italian political arena. A coalition of the two anti-establishment parties, Lega and 5SM, was all but blocked by President Sergio Mattarella because of a eurosceptic finance minister. 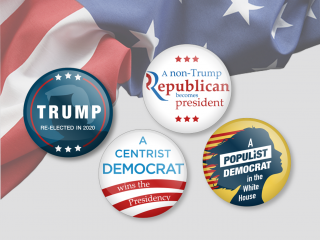 After the proposal of a technical government, a plan that was doomed to fail from the outset, and a subsequent violent financial market reaction, both populist parties eventually managed to clinch a deal, which got the presidential green light. This led to some relief on financial markets. However, we will have to see to what extent the new Italian government will want to play along with European (fiscal) rules. Some of their plans would drive the budget deficit significantly higher if implemented all at once. We expect that some compromise will be reached eventually, which could leave Italy with a mildly expansionary fiscal policy, though probably only after severe tensions with the EU. The good news is that in recent polls a comfortable majority of the Italian population still back the euro, which should make the coalition more reluctant to gamble with Italy’s future as a member of the Monetary Union. Meanwhile, the Italian government will probably want to score some points on immigration and a recognition of Italy’s burden at the June EU summit could help in this regard. In Spain, Prime Minister Mariano Rajoy was unseated in a vote of confidence and replaced by the socialist leader Pedro Sanchez. Sanchez will lead a minority government supported by the far left party Podemos and a number of small regional parties, which threatens to make it quite unstable. We think that new elections are likely to happen over the next 12 months but in the meantime, Sanchez surprised with a pro-European stance and willingness to actively steer the eurozone reform debate. While it’s too soon to assess the impact of the political turmoil on the economy, we can certainly say that second-quarter growth will hardly be better than the moderate growth in the first quarter. Sentiment indicators stabilised in April and May, but didn’t recover from their drop in the first quarter. However, the backbone of the recovery is still strong. When looking at consumer confidence, it is true that households have become a bit less upbeat on the economy in general. But at the same time, they’re very positive about their own financial situation and on employment prospects, which remains a good base for further consumption growth. On top of that, oil prices have started to come down, which will support purchasing power in the coming months. On the back of low interest rates, the order books assessment in the construction sector was at its highest level ever in May. 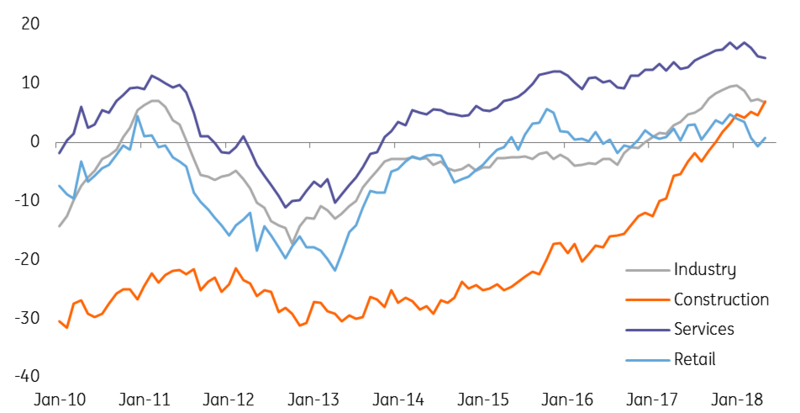 And while sentiment indicators have come down both in the services and manufacturing sectors, they remain at relatively elevated levels. The heady increase of HICP inflation to 1.9% in May was stronger than expected, strengthening the case of the hawks within the ECB. However, most of the rise was due to higher oil prices in combination with a somewhat weaker euro. Since oil prices are falling again and the euro exchange rate is not expected to weaken much further from current levels, the upward impact on inflation should dissipate gradually over the course of the year. Moreover, core inflation remains at 1.1%, which is still on the low side. Despite new uncertainties, the ECB seems to be willing to gradually bring QE to an end. The latest remarks by ECB chief economist Peter Praet suggest that even the doves are open to discussing tapering. We still believe that the ECB will be wary of ending QE prematurely in order to keep a maximum level of flexibility. But an announcement at the June meeting of a short extension of the Asset Purchase Programme until the end of the year at €10 billion euro per month, while keeping the statement open-ended, has become more likely. As for rate hikes, our base scenario remains a first increase in September 2019.